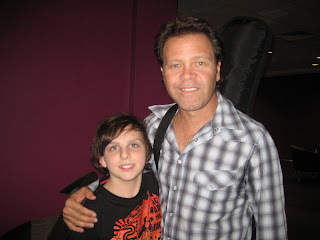 Last night I went to the sound check and part of the concert at the Coffs Harbour Ex-Services Club for Troy Cassar-Daley and his support act Felicity Urquhart. I got to meet them and have a chat and a photo. Felicity Urquhart was on the Christmas CD that I organised to raise money for chronically ill children at The Children's Hospital at Westmead. Felcity donated a song for the CD. We are doing another Christmas Album next year and I have asked Troy if he would like to be on it. We are in talks about that ......... got keep it a secret as to who I have on the next one !! The concert was great they both are great singers and entertainers and lovely people. It is a shame they can't make it for Rock with Connor. Maybe we can get them on the 2010 one !! !